"When I returned from the South Pacific after serving three years in World War II, I pledged Sigma Nu and experienced an opportunity to truly bond with so many different and wonderful Gamma Alpha brothers. Some of us veterans were in our late twenties, interacting with brothers having a 10-year age difference in many cases. The memories and relationships are some of the best in my life. I know the younger brothers felt they learned from us, and we felt we also learned so much from them. I am proud to support this building campaign and look forward to the opening celebration." "The Gamma Alpha Chapter of Sigma Nu at Georgia Tech means a great deal to the entire Edenfield family. It is basically a part of our DNA, with two generations having enjoyed the benefits of Gamma Alpha. I was very excited to hear about the new fraternity house for Sigma Nu and am pleased to be able to financially support the campaign. Great men have entered that house for over 55 years. Now great men will emerge from our new house for the next 55 years. The Edenfields are proud to be Sigma Nus and to be part of this building campaign." "I have pledged $100,000 to the Building the Future ... Today campaign as a way of giving something back to Gamma Alpha of Sigma Nu. My own experience in the fraternity was brief yet memorable. I pledged in my junior year because of a persuasive and outstanding group of seniors whom I admired and respected. It stretched my financial resources at the time but actually encouraged me to succeed. It was financially important not to fail any classes and to graduate as soon as possible. Brothers like Buck Stith (#923), Aubrey Motz (#1012), Charlie Brady (#909), Duke Mewborn, Freddy Motz (#1011), Al Cadora (#1044), Frank Spears (#1326), Gary Jones (#1290), Jerry Cox (#1057), Andy McKenna (#1237) & Pat McKenna (#1345) are still my good friends today. My hat is off to the outstanding leadership of this campaign." "Sigma Nu really allowed me to connect the dots, in that I left Georgia Tech with an enormous amount of confidence in my abilities to succeed. The interactions with my Sigma Nu brothers led me to become more mature. We shared our successes, and we shared our failures. I must admit the failures quite possibly provided more of a learning tool for all of us. We all learned a great deal about empathy. Certainly my experiences as a brother in Gamma Alpha of Sigma Nu established the fundamentals that allowed me to become an effective leader. Thank you to the men of Gamma Alpha." "I gained so much from the fraternity in terms of lifelong friendships that I want to help make sure future generations of Sigma Nus at Georgia Tech have the same opportunities to build similar bonds of brotherhood. I continue to stay involved and be supportive of the Gamma Alpha Chapter, and I recognize how important a state-of-the-art facility is to attracting top-quality young men. 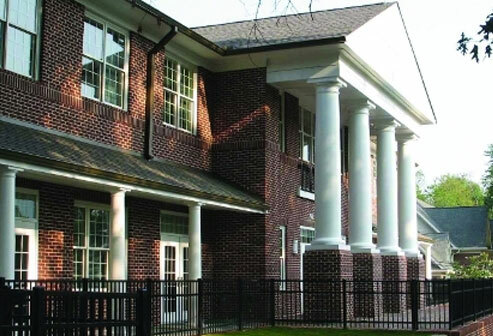 The new fraternity house will provide a wonderful and stately home for generations of Sigma Nu men to come." "We have assembled a dedicated team of Gamma Alpha brothers to restructure the housing corporation, and to revive and rejuvenate the alumni association. Now we are raising the funds necessary to build a new fraternity house. I would have never been able to navigate Mother Tech without the support and life-long friendships I established at Sigma Nu. My renewed involvement in Sigma Nu is a chance to reconnect to a certain time and place and, more importantly, to a brotherhood that played a vital role in my life. I am pleased to be able to make a leadership gift to the Building the Future ... Today campaign." "In many ways, my fraternity experiences at Sigma Nu molded who I am. The memories of the house, and the life-long friendships and relationships, are very special. I am honored to be a part of Sigma Nu, and will treasure the camaraderie and brotherhood forever. It truly is a joy and an honor to be involved in this vitally important building campaign." "My time at Gamma Alpha of Sigma Nu, besides involving a lot of fun with some awesome brothers, provided excellent practical training in a variety of life skills, and created an environment that produced outstanding experiences and growth. The social development alone, from interacting with so many brothers from so many different backgrounds, was invaluable. The memories of the house and the brotherhood are some of the most vivid and treasured of my life. Being one of three proud McKennas who have been Gamma Alphas of Sigma Nu, I am pleased to support this campaign, and the efforts of the alumni association, with my time and my financial contribution." "I chose to get involved initially with the alumni association and the housing corporation just to lend a helping hand on a part-time basis. Little did I realize how much time I would put in. More importantly, little did I imagine how many wonderful blessings and memories I would receive in return. During one's undergraduate days, in just four short years you develop what turns out to be lifelong friendships unlike any others you will make for the rest of your life. Sigma Nu has a special spot in my heart, and I am pleased to make a five-figure gift to this campaign as well as a gift to the alumni association every year." "I am proud to claim Gamma Alpha of Sigma Nu as my fraternity and am pleased to be in a position to make a leadership gift for this campaign, Building the Future ... Today. My brother Brennan Robison '87 (#1666) and I are both Gamma Alphas, and recognize that a new house will provide the stable foundation we need to grow. The product we offer in new housing will ultimately be reflected in the caliber of the candidates we are able to attract during rush. Thank you to all Gamma Alphas for supporting the building campaign and for making annual gifts to the alumni association." "Pledging Sigma Nu turned out to be a very good decision for me. Many of the great things in my life can be traced to 750 Fowler Street. The current undergraduates at Sigma Nu are a band of brothers of whom we can all be proud. I am thoroughly enjoying my involvement as president of the alumni association, and thank all the generous brothers for their participation in our annual giving fund in addition to the five-year pledges for the building campaign. Sigma Nu continues to perpetuate its ideals, and Gamma Alpha brothers Walk in the Way of Honor!" "The Gamma Alpha brotherhood was the biggest influence on successfully completing my education at Georgia Tech. I couldn't have done it without the support and camaraderie of all the great friends I made at 750 Fowler Street! My current role and involvement working with the undergraduates as chapter adviser has been extremely rewarding, and serves to reinforce my love and passion for Sigma Nu."